Al Zon was born in North Dakota. He received his BS degree in education from Mayville State University, and his Masters Degree from Southern Oregon University. He moved to Oregon in 1964. Al retired from teaching at Phoenix High School. He is president of the Shelter Conference and Operations VP. This is his thirteenth year at SVDP. Born in Minnesota and, at two years old, moved to South Dakota when my dad signed on as the dentist at the VA Hospital. At age eight, we moved to Texas where I grew up and became an Elementary Physical Education Teacher. After twenty-five years of teaching, consulting and various asundry other things, I moved to Oregon. Ten years of employment with Harry & David ended a couple years ago with their first major layoff. I love it here and spend my time volunteering at St. Vincent de Paul and the Central Point Senior Center. I have one son who lives in Medford and manages the FedEx Office store. At present, I am a retiree with two cats who dictate my life, I do like to read, travel when possible, and am always ready to visit with friends. Jim has been a business consultant, computer center manager, account executive for an investment firm, business owner/manager, production planning and control manager and systems manager. He graduated from Oregon State University with a BS in Industrial Engineering, and from the University of Washington with a MBA in Business Administration.Besides volunteering at SVDP as Treasurer, Jim's interests include motorcycle touring, snow skiing, investing and gardening. Nancy hails from Wisconsin where, in a former life, she was an automation librarian, supporting public librarians in a ten-county area. She and her husband, Bill, arrived in Medford in 2004, after “interviewing” at least five cities in the U.S. for liveability. Besides volunteering at SVDP and Habitat for Humanity Restore, they are avid gardeners. Members of Jackson County Master Gardeners and the Medford Garden Club, they maintain the city's smallest park, the Main Street Green, and the native plants garden in the Eastwood Cemetery. Karen is one of eight children born in Vermont whose parents taught them the spirit of volunteering. 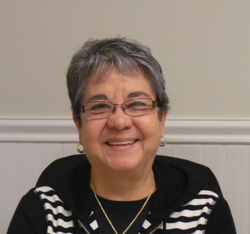 She has been a volunteer with the St. Vincent de Paul Thrift Store for more than twenty years and has been volunteer store manager for the last fifteen. She also served as Council Secretary for about five years. Karen has also volunteered with Red Cross, Sacred Heart School, St Mary’s School, Girl Scouts, Sacred Heart Parish and Shepherd of the Valley Fall Festival. Karen worked for Harry & David for more than twenty-two years as a Corporate Sales Executive and Regional Sales Manager. She and her husband Pat live in Gold Hill and have three children and four grandchildren and loves to travel. If you have been in our offices during the last year, you have probably heard the contagious laughter of a young bubbly blonde named Christina Wernecke. She is always smiling, whether greeting clients, talking to another volunteer or talking on the phone. This remarkable young lady came to St Vincent about one year ago, when invited by an ad for volunteers on our marque sign. Christina was born and raised in Pomeroy, Washington where her parents owned a large grocery store. She came to the area in 2008 by way of Grants Pass and Eastern Oregon. She not only has added a dimension of youth, humor and vitally to the office conference but this April she was elected as the President of the St Anna Office conference when Kathy Begley became Executive Assistant to the Council. She has met a nice guy locally and they are planning to get married on Maui in October of 2015. We are so blessed that God put Christina in our lives and inspired by her agreeing to become the office conference President. Thank you Christina for saying yes and helping us do the service God calls us to do.